"bomb-proof concrete bunker encased in permafrost, 130 meters-deep inside the sandstone of a Norwegian mountain. 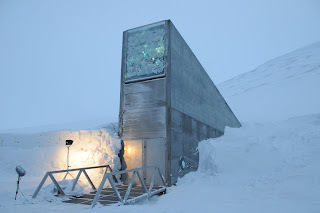 It will store copies of seeds currently housed in the more than 1,400 gene banks worldwide, so that should calamity strike any of those gene banks, Svalbard’s seeds will save the collections—and thus humanity—from the jaws of famine." "The small Rome-based organization (the Global Crop Diversity Trust) has launched an ambitious rescue program aimed at keeping seed stocks above that crucial 85 percent regeneration rate, providing the equipment, labor, training, and supplies (such as airtight seed envelopes) for gene banks in some 70 countries to replant their samples, cull fresh seed, and update their records on approximately 100,000 samples. Following successful regeneration, many previously inaccessible seeds will for the first time be available to plant breeders, plant geneticists, and plant pathologists"